Happy Birthday card to Tracy! Vintage style image (Stamp camp), little colouring with Distress Inks and crackle paint; papers from Basic Grey and DCWV Old World Matstack; lace, ribbon and Wild Orchid's flowers. Little red colour - her favourite! 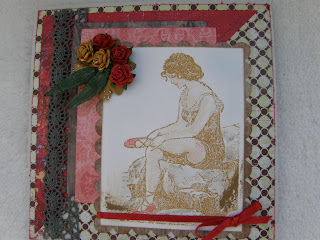 Mervi this is such a lovely Vintage inspired creation. From the pretty paper to the colors-it is simply splendid. A wonderful job with the sketch this week. Thanks for playing along with us at the Midnight Madness Sketch Challenge. We appreciated you gracing us with your fabulous creation. Love the image of the ballerina! Your papers are lovely and the touch of red in the papers and the flowers just pop off the paper. Wonderful take on the sketch. Glad you could join us this week for the MMSC. PRETTY :)Lovely card and Excellent take on the sketch. Thank you so much for playing the Midnight Madness sketch challenge this week. Looking forward to seeing what you will do with MMSC47. This is a special and really beautiful card and means alot to me, thank you Mervi.